While writing a birthday card in Spanish can be a deeply moving gesture for someone from a Hispanic or Latino background, it can also prove difficult if the writer doesn’t know how to speak Spanish. A rudimentary grasp of Spanish grammar and some simple phrases makes the task significantly easier. Unlike English, Spanish uses different grammatical forms to distinguish between intimates and superiors. If you’re writing a birthday card to a boss, for example, you won’t use the same form of “you” that you would use for a friend or romantic partner. “Tú” is the informal you, while “usted” is the formal you, which conveys respect for the person being addressed. 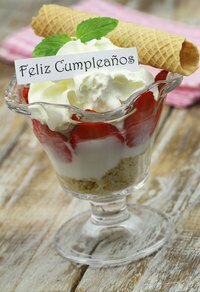 When writing the salutation, you might address a superior with “Senor” or “Senorita” followed by his or her name, while in an informal birthday card you might say “Querido amigo” or “Querida amiga,” both phrases that mean “Dear friend” but with different endings depending on the gender of the speaker. If you and the recipient have a close relationship, tell her you love her by saying “Te quiero” or “Te quiero mucho,” which means “I love you” and “I love you so much” respectively. Let her know that you think about her often by saying “Siempra estás en mi mente,” which means “You’re always on my mind,” or “Yo siempre te llevo en mi corazón,” which means “I carry you always in my heart.” If the recipient is not someone with whom you're in a close relationship, a simple “Espero que lo pases bien!”, which means “I hope your day passes well,” will suffice. What Should I Write in a Career Anniversary Card?